One of the most talked-about presentations at this week’s National Bike Summit came from Jason Gaikowski, director of sales for the Bloomington, Minnesota-based wholesale distributor Quality Bicycle Products. Over the last several years, QBP has ramped up its employee health and wellness program, which includes incentives to bike to work. At a time when most employers are grappling with rising insurance premiums, a study by the company’s health insurance provider, HealthPartners [PDF], suggests the program has helped reduce QBP’s health care costs and increase employee productivity. Gaikowski made the case that QBP’s example bears a lesson for the nation’s transportation policy makers: Investment in infrastructure that supports active transportation can help rein in the country’s skyrocketing health care costs. While you probably want to take research on the health benefits of cycling commissioned by a bike company with a grain of salt, Gaikowski’s basic premise has already been embraced by the experts at the Centers for Disease Control. The QBP/HealthPartners case study adds some intriguing data about the potential impact of bike commuting on employee health and the corporate bottom line, and it suggests some areas ripe for further study. As part of its wellness program, QBP offers a few inducements for employees to commute by bike: The company provides secure parking and showers at work, and it pays employees $3 each day they ride to work. The cash payments add up to about $45,000 each year. While the study doesn’t isolate the impact of bike commuting on lower health care costs, the program seems to be paying off. HealthPartners reported that participants in the “Bike to Work” program (about 100 of QBP’s 464 employees) cost approximately $200,000 less per year in health care claims annually, based on a comparison with employees who don’t participate in the program. 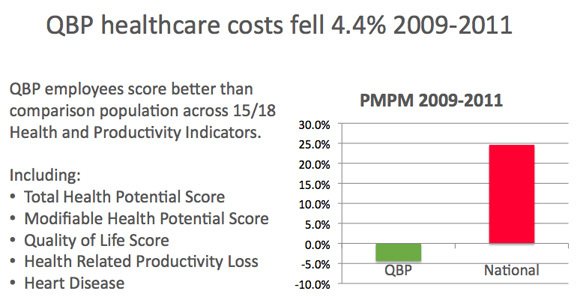 QBP’s overall health care expenses declined 4.4 percent between 2009 and 2011, according to the report, while on average health care costs for American companies rose 24.6 percent during the same period. HealthPartners attributes some of the decline to QBP’s Bike to Work program, as well as employees’ healthier eating habits and a shift to generic drug purchases. In addition, HealthPartners reported that QBP’s health and wellness initiative, of which the Bike to Work program is the most significant component, is boosting employee productivity. With employees missing fewer work days due to health-related problems and overall health scores improving, the insurer estimates that the wellness program prevents the equivalent of $300,000 per year in lost productivity. Sounds like the savings could be to the employer, in lower premiums, or the health insurance company, in lower claims. Either has an incentive to encourage bike riding. BTW, my employer’s health insurance company will reimburse my expenses for a health club I pay for but seldom go to, but not for riding to work. This is totally meaningless data. The group the rides to work is hardly a representative sample, it’s not even controlled for pre-study wellness level or age. The signal/noise ratio is pretty pathetic in this case, and sadly, clogs up too much of the legitimate case-studies for cycling. BloomingTON. Not Bloomfield. The suburb of the Twin Cities is also known as the home of the Mall of America and once was the home of Metropolitan Stadium. Which was a field. @abb249055208c7af4d35568e422dfd63:disqus I agree the data here is suggestive, not conclusive. But I haven’t come across other research that looks into the link between cycling and outcomes like employee productivity and health care costs. It would be great to see an independent, rigorously conducted version of this report. Larry, under ACA the insurer could not keep more than 20% of medical cost savings. But employer could, if it is paying the premiums. Amsterdam, The Netherlands: People who cycle through London and other major cities have higher levels of black carbon in their airway cells, experts from the UK have shown. The research, which will be presented at the European Respiratory Society’s Annual Congress in Amsterdam today (25 September 2011), suggests that cyclists inhale more black carbon than pedestrians, which may cause damage to the lungs. The combustion of fossil fuels results in the generation of large numbers of inhalable particles of soot (black carbon). There is increasing evidence that inhalation of black carbon particles is associated with a wide range of health effects – including heart attacks and reduced lung function. The researchers, led by Professor Jonathan Grigg from Barts and the London School of Medicine, aimed to identify whether the way healthy adults commute to work affects their exposure to black carbon. Specifically, they tested the hypothesis that cyclists have higher personal exposure to black carbon. To test this theory the study compared the lung dose of black carbon in cyclists and pedestrians. To measure lung dose the researchers sampled a lower airway cell called the airway macrophage – a specialised cell that sits on the airway surface and ingests foreign material. The researchers collected sputum samples from five adults who regularly cycled to work in London and five pedestrians and analysed the amount of black carbon found in their airway macrophages. All participants in the study were non-smoking healthy urban commuters aged between 18 and 40 yrs. The results showed that in this small sample, cyclists have 2.3-times more black carbon in their lungs when compared with pedestrians. The probability that this difference occurred by chance is less than 1 in 100. The study referenced by Nov0798 should provide clear evidence that we must work to massively reduce vehicle emissions. One of the easiest ways to do that? Since you can’t easily and affordably retrofit the cars, getting more people out of cars and on bikes will reduce overall emissions. Thus, air quality will be reduced for everyone – even those behind the wheel. During my last summer in Washington D.C., there were quite a few red days for air quality. People were encouraged NOT to ride because the air was so bad. So is the solution to a bad air day to drive instead of ride? Nice and informative post.I really appreciate and I think It would be great to see an independent, rigorously conducted version of this report. GOP’s New Attack on Health Care Reform Bill: It Promotes Walking!